Meet all your favourite PM characters in the PM Oral Literacy Rhymes Big Book and IWB CD. This beautiful full-colour big book includes short four-line rhymes that focus on well-known PM characters such as Baby Bear, Sam and Bingo, Monkey, Rabbit and Little Teddy and many more. Reciting and singing rhymes and poems is one of the important first steps in the development of oral literacy skills of young students. Rhyming verses provide opportunities for students to hear the sounds of language in a rhythmical way while enhancing their phonemic awareness and understanding of patterns, and exposing them to new words. Each rhyme has been designed to be read alongside its related PM reading book. 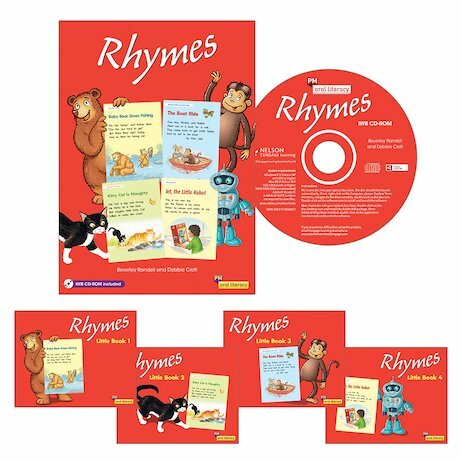 The PM Rhymes IWB CD includes audio so students can listen and recite or sing along to their PM Rhymes. The rhymes from the big book also appear in the PM Rhymes Little Books 1-4. The individual books contain further rhymes on our favourite characters – making this the perfect pack for using rhymes to improve oral schools.